This fall there are so many chic men's inspired pieces to choose from--like these loafers by Tory Burch. They're super comfortable and versatile. Over the weekend I wore them in a head-to-toe men's inspired look that included a cargo jacket and silk button-up. I also plan to slip them on with a pretty floral dress and chunky knit cardigan. Love this! Such an adorable jacket! SUPER PRETTY! I love the military jacket with the yellow silk! Too cute, Taylor -- I love the loafers! Really great outfit.. Loving the loafers!! 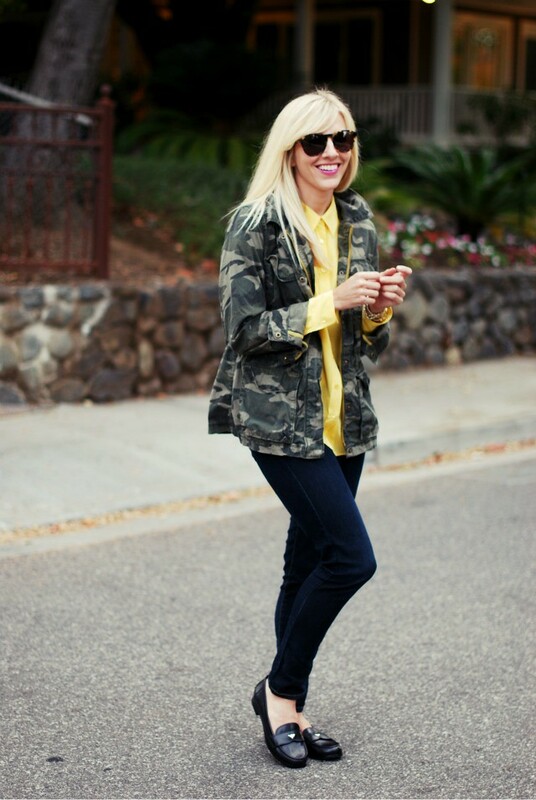 The lemon hued blouse with the camouflage jacket is super cute! I love the bright yellow blouse. I always am drawn to yellow, but really can't wear it without looking all sickly. Such a shame. Great outfit, nice, comfortable, but cute at the same time! u know..u look a lot like natasha bedingfield! Yellow is such a good color on you! Love the Tory shoes! Love the shuz! Although it's hard not to like anything from Tory Burch. Great color on the button-up too. those types of loafers can look fabulous with chinos, as well as jeans. throwing them on with a flirty floral print is a great idea to juxtapose masculine and feminine details. Love those shoes! Looks great with this outfit and the color of that blouse is stunning. This outfit is perfectly balanced! 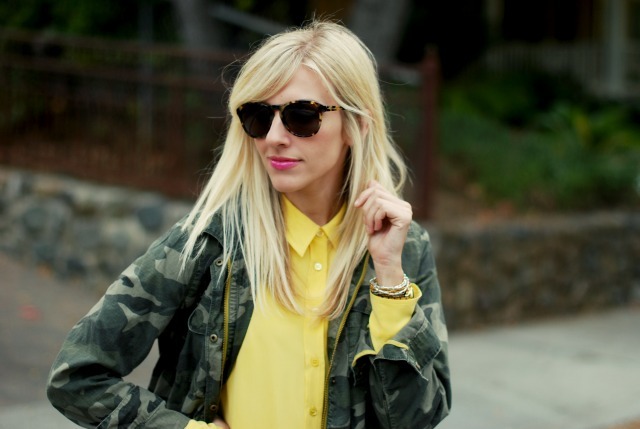 The girly yellow blouse paired with the army jacket is so cute. Love it. Have a wonderful day! You have the greatest lipstick colors, I swear. And those loafers look so comfy! Love this outfit! You do menswear well. Cool outfit! Love the contrast with the camo and bright yellow, the shoes are manly chic! The cargo jacket looks awesome with this bright punch of yellow. Such a cute look. love the loafers. classic & cute. Love this! I am totally sporting my cargo jacket this year also. LOVE YOUR OUTFIT! REALLY PRETTY! Even in an attempt to look like one of the boys, you still look so very pretty. Nice and fun outfit. i actually totally love this look, and i'm not a menswear kind of girl! great job! Love the entire look, the pop of the Equipment blouse against the camo and the loafers remind me of elementary school! great top and i LOVE those loafers! Loving these loafers and this outfit.Can't wait to see how else you incorporate these loafers this fall. I have been obsessed with my military green cargo jacket as well, I can't stop wearing it! Love the men's inspired look you are sporting--it has a touch of femininity as well with the bright yellow blouse and jewelry. Thanks for sharing! 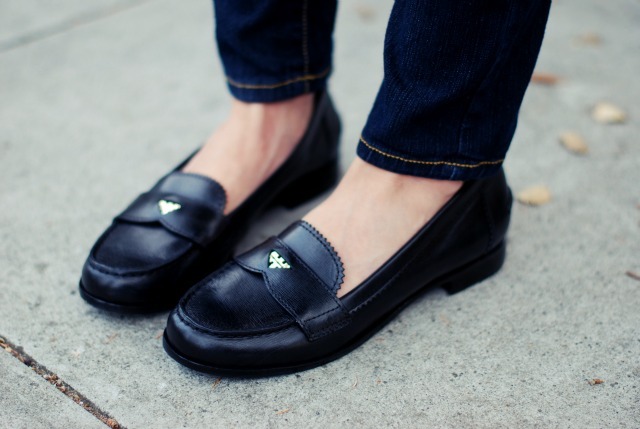 definitely need some loafers for the fall, you look great! Do you know what's crazy? I've been just wondering the other day how to style my camo jacket and then I find this all beautifully styled and all! Perfect thing I wanted. Those shoes are soo cute. I am wearing my loafers everywhere, as I am walking everywhere. I just can't last long in heels - you wear it well! That jacket mixed with that amazing pop of color is just perfect. You look so chic and relaxed, which is the epitome of the perfect outfit. Fabulous! The outfit is perfect! ohh i love your shoes!! !you look great! Hi,I was very pleased to find this site. I definitely enjoyed reading every little bit of it and I have it bookmarked to check out new stuff posted regularly.